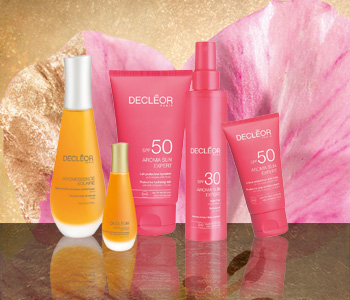 Get effective UVA/UVB protection with the Decléor Suncare collection, a range of shielding suncare that’s perfect for all skin types. No matter your age or your skin concern, there’s a high efficiency Decléor Suncare product for you. Its full range of textures and finishes will ensure that your skin will be optimally shielded from damage. Protect your skin before, during and after sun exposure, and feel confident and protected every time you step into the sun.